New legislation took effect in April banning the sale of alcoholic drinks with an ABV of up to 5% in all convenience stores and small retailers across Indonesia. The world’s fourth most populous country has introduced the legislation in a bid to reduce the prevalence of excessive alcohol consumption nationwide. 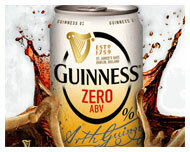 Now Diageo has produced a zero-alcohol variant of Guinness, which typically features an ABV of between 4.1% and 4.3% in Europe, to help improve access to the brand’s products. Rolled out across Indonesia, it is also hoped that the new product will help increase Guinness’ appeal among the country’s majority Islamic population, who are forbidden from consuming alcohol by the Qur’an. There are currently no plans to extend trial of the product to Guinness’ native Irish market, according to the Sunday edition of Dublin newspaper Irish Independent.